Emma’s earning money left and right—but is she in over her head? When Mia asks the Cupcake Club girls to be junior bridesmaids in her mother’s wedding, everyone is superexcited about the idea...especially when they find the perfect dress for the occasion! It’s Emma’s dream dress, except it’s a little more expensive than she expected. And with her mom recently out of work, there’s not a lot of room at the Taylor house for extras. Not wanting to disappoint her friends, Emma decides to take on a few more jobs and chores around the house to help cover the cost. 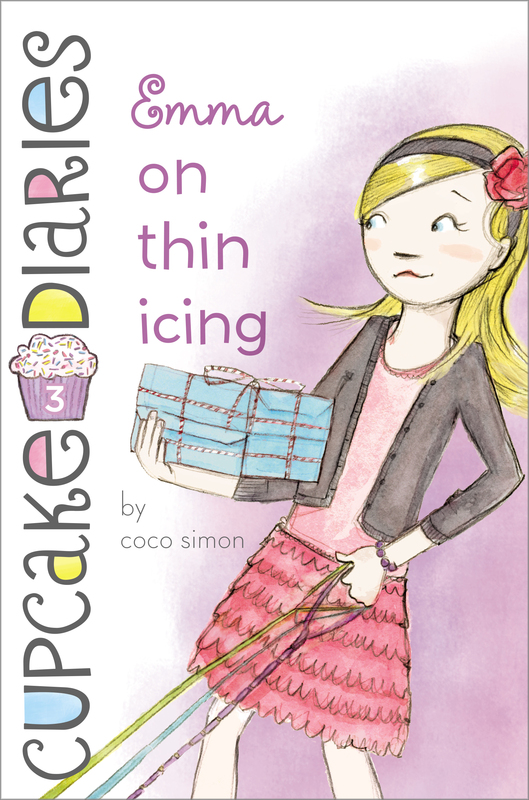 Between babysitting her bratty brother, a dog-walking business, flute practice, the Cupcake Club—and oh yeah, being a typical tween girl—Emma may have bitten off more than she can chew. Can she handle it all? My name is Emma Taylor, and my life can be pretty hectic sometimes. I have three brothers, four goldfish, a guinea pig, and two jobs. Yup, two businesses. The first is a dog-walking job I have after school. My other job isn’t really a job. It’s a club with my best friends—Alexis, Katie, and Mia. Together we’re the Cupcake Club. We bake and sell cupcakes for different people and events. It’s totally fun, but we don’t earn that much money . . . yet. Between my brothers, chores, and the club, things can get pretty crazy. Most of the time, though, being in the middle of all this craziness can mean getting some pretty great inspirations. Like the one I had about bacon. Bacon cupcakes. Trust me, they’re great. They’re salty with the bacon and sweet with the sugar and the combination is really the best. It just sounds gross. I had been waiting to bring it up until just the right time, so finally, at our club meeting, I decided to see how it would fly. We were talking about new ideas because we’re always trying out new things, depending on the event. I was a little nervous, but I decided to float the idea. “Okay, ready? How about . . . bacon cupcakes?” I asked. I spread my arms wide in an arc—like “ta-da”—as I announced my idea. I wasn’t sure how the others would react to it, but I thought it was pretty neat. And original. That was for sure. I just hoped they didn’t think I was nuts. “Ewwww!” cried Katie, with a full-body shudder. “Are you kidding me?” Alexis looked so horrified, you would have thought I had suggested road-kill cupcakes. Mia was pretty hip. She had long, straight, dark hair and really cool outfits, and was from Manhattan. I have no idea how she knew what was “in” or what wasn’t, but we all pretty much listened when she said something was in. So Katie and Alexis stopped their dramatic groaning and belly-clutching and listened. “Like an extra order?” asked Katie. “Emma, you may have just doubled our revenue!” said Alexis, ever the businesswoman. She raised her glass of Gatorade in a toast. I smiled and raised my glass back at her. Alexis actually did look like a businesswoman right now with her red hair up in a bun and a sensible button-down shirt, holding a calculator and a pad of paper. The Cupcake Club was meeting in Mia’s cozy room to brainstorm about upcoming jobs. One of our next big events was Mia’s mom’s wedding to Eddie, her supernice fiancé. We were all excited for Mia because Eddie was great and her mom was really happy. But we were also excited for ourselves because Mia’s mom had placed an order with the club for cupcakes for the wedding! She had given us the green light to do whatever we thought was appropriate. And I thought bacon cupcakes were appropriate. Best of all, she would pay us for the order. Alexis was taking notes. “Okay, let me just read this back to you. One idea is a circular cupcake wedding cake built with three sizes of cupcakes to make up the tiers—our medium, large, and jumbo sizes building out the cake, with a few minis on top. The cake would be white, the frosting white buttercream. Decorations would be white flowers molded from edible fondant. Cupcake papers would be shiny and white.” She looked up at the other Cupcake Club members for confirmation. We all nodded, and she looked back at her notes. “Another idea is to do all minis laid out in a large sheet, mostly white cake and white frosting but with select cupcakes frosted in pink raspberry frosting and placed to form the shape of a heart in the middle of the layout.” Again, we nodded. The mini cupcakes were very popular; they were not much bigger than a quarter and they could be consumed easily in vast quantities. “Wait!” interrupted Mia, her eyes shining with excitement. “I have great news.” She clasped her hands together. I restrained myself from looking at my watch. I didn’t want to be rude, but I prided myself on being extremely punctual and organized and I had to be at the Andersons’ to walk Jenner, their retired greyhound rescue dog, at four o’clock. It had to be almost three forty-five now. I really hated to be late. I also didn’t want to lose the dog-walking job. In fact, I couldn’t afford to. Meanwhile Mia had paused for effect. Then taking a deep, dramatic breath she announced, “My mom wants us all . . . the four of us . . . to be junior bridesmaids at the wedding!” Mia jumped up on the couch and started to hop up and down with excitement, swinging her arms. “Oh my gosh!” cried Katie, jumping up after her. “I’ve never even been to a wedding, never mind in one!” She jumped up and down too. “Me neither!” I cried. I jumped up on the couch, since it appeared that was how we were celebrating. I caught a glimpse of Katie’s watch in midair as her arm sailed past. Three forty-nine. Could I leave now? No, that would be rude. I had to stick it out for five more minutes to enjoy the news with the other girls. And it was good news. “That is excellent,” said Alexis definitively. She was not the couch-jumping type, but we loved her anyway. “Your mom is so cool,” I said. Then I felt bad. My mom was cool too, but she’d been distracted and out of touch the past couple of weeks because she’d gotten furloughed, or suspended, from her job at the town library due to government cutbacks. Basically they’d told her to go home until they could come up with some money to pay her. Last week she’d finally had to take a part-time job at the bookstore at the mall just to have some extra income. But the hours were terrible and our family’s routines and schedules had been turned upside down. This was bad because I love a schedule, and I get really jumpy and grumpy when my schedules get messed up. My dad had given me and my three brothers a pep talk about how we had to stick together and pitch in and not worry Mom or put any pressure on her. It was hard. But I was nothing if not dependable. “I know I don’t have to worry about you, Emma,” Mom would always say. And I made sure she really didn’t have to worry about me now. But I missed seeing Mom and having her there when I got home after school. She was always running around these days. To be honest I wasn’t sure my mom even remembered what the Cupcake Club was, let alone how important it had become to us. It had all started on the first day of middle school, when we sat together at lunch, and we stared at Katie’s delicious homemade cupcake. The next day she brought in cupcakes to share and they were good. Really good. It was Alexis’s idea to bring cupcakes every Friday, and we all took turns. We all banded together then. We stuck together when Sydney Whitman formed the Popular Girls Club and none of us were in it. We started to bake together and then formed a business. The Cupcake Club took off, and we began making cupcakes for events all over town. It was sometimes a lot of work, but it was also a lot of fun. “So what are we going to wear?” asked Katie. “Yes, I was there when my mom went to try on her wedding dress for the first time . . . ,” began Mia, warming to the topic. I wanted to stay and listen, but I started getting antsy. I had not budgeted time for this and now I was stuck here for another ten minutes at least, discussing the various types of wedding dresses and junior bridesmaid dresses. And worse, I knew that if we had to buy dresses for the wedding, it would be a big expense. Since my mom had lost her job, there hadn’t been any money for extras. There was hardly enough money for clothes or sporting goods. (In a house with three brothers, sporting goods were as much of a basic necessity as food. Things were always getting lost or being outgrown.) We had to earn extra spending money for movies and pizza and things like that, which is why I started walking Jenner. I tried to save most of my dog-walking money, though. I had been saving up for so long for a pink KitchenAid mixer I’d seen in the Williams-Sonoma catalog. We were the only ones who didn’t have a fancy mixer, and baking at our house was such a pain when someone had to use the old handheld one we had. Oh no. Would I have to spend all the money on a bridesmaid’s dress? “What do you think?” asked Mia, turning to me. “Huh?” I said. I had been thinking about my savings account. I could feel my face get red. “I guess I should be eating more cupcakes to keep my energy up,” I joked. It was just that I had so much to keep track of: school, flute practice (I’m in the school orchestra), Cupcake Club, my new job walking the neighbors’ dog, and babysitting my younger brother. It was getting to be a lot. I hadn’t told anyone about my mom’s job or how I had to babysit Jake more or how many conversations we had about saving money at my house. I instantly felt rotten about putting any kind of damper on what should have been a great moment for Mia. I didn’t want her to think I wasn’t excited. “No, you’re not rambling at all! And I am so psyched about your mom’s wedding. I think it’s so cool that we get to do the cupcakes, and I am so excited about us being junior bridesmaids. It’s so amazing.” I really did mean it. It was great news. Well, it wasn’t a total lie. I did have to watch Jake, but not until tomorrow, when my brother Matt had basketball practice. It was his turn to watch Jake after school today. Running out on them for Jake sounded more legitimate than running out on them for a dog, that’s all. “Oh no! Go! We’re totally done,” said Mia sweetly. “What about the Garner job? The four-year-old’s birthday party? We need to submit a bid for that . . . ,” said Alexis. I froze. I was halfway to standing up, and I plunked back down on the couch. The club rule was that we all had do to the planning together so no one got stuck with it (even though I secretly thought Alexis would totally be okay doing all of it). I was torn. I hated feeling like this. “Really?” I knew I was biting my lip. I looked at Alexis, and she nodded. “Okay,” I said. “Sorry.” I gave Mia a big hug. “Just let me know the details . . .” Then I grabbed my backpack and hustled out. I am going to be so late, I thought as I dashed out of Mia’s house, which I loved. Everything here was so stylish and neat and clean in contrast to my house, where everything was sturdy enough for three boys and slightly trashed and of questionable cleanliness. Just yesterday I had to kick three pairs of Matt’s disgustingly stinky socks off the sofa before I sat down. I clipped my bike helmet on and hopped on my bike. Well it was mine now. It was a hand-me-down from Sam, my eldest brother, by way of Matt, the next one down. It was a boys’ bike, with a bar, and it was gray and a little too big for me. But it was in decent shape and totally reliable. I pumped hard for the seven blocks home, standing up on the pedals almost the whole way, and taking the most efficient route. I passed Jake’s bus, which was stopped on the block before our house. Flying by at top speed, I just waved at all of the windows. One of them had to be Jake’s. I turned up the driveway, ditched my bike in the rack so I didn’t get yelled at for leaving it out, ran into the mudroom and dumped my backpack and flute case into my locker (yes, we actually have lockers at home; it is the only way to contain the madness, my mom says), and was about to dash back out to get Jenner for his walk. “Where have you been?” Matt screeched. He went flying past me out the door, dressed in his basketball uniform with his jacket over it, the jacket flapping open in his haste. His light, curly hair was smushed under a baseball hat and his blue eyes flashed with impatience. “What?” I asked, not comprehending. I followed him out to the driveway. “They changed my practice time!” yelled Matt, hopping on a bike. My bike! “He’s all yours! Mom said! And it used to be my bike so I still can claim it!” And Matt went sailing off. The bus pulled up, and Jake shuffled out. His shaggy blond hair was all messed up and his blue eyes looked tired. He had on jeans and his favorite T-shirt; it was blue and said NYPD. “Bye, buddy!” called Sal, the driver. Sal waved at me. I sighed and waved back. This was not what I bargained for. “Hi, Emmy,” said Jake as he trudged up the driveway. His backpack was bigger than his whole back. I couldn’t imagine what he carried in it besides his lunch. “Hi, pal.” I sighed again and took a deep breath. I didn’t want to snap at him. It wasn’t Jake’s fault Matt had ditched him. It wasn’t his fault that Mom had a new part-time job so she couldn’t be home to meet him after school. I thought about how I was going to negotiate this. Jake requires careful planning. “I’ll grab you a quick snack while you use the bathroom and then we’ll go walk Jenner real quick, okay?” I said, trying to keep my voice light. Jake could be a bit of a tyrant, and if he wasn’t in the mood to do something, there was no way he’d do it. It was a little like taking care of a puppy. I could see the Jenner walking job slipping away, and I couldn’t let that happen. I had to think fast. “You can bring your scooter and . . . we’ll go to Camden’s, and I’ll buy you a piece of candy!” It would cost me, but it would be worth it. This sent Jake into peals of laughter, and I knew I had him. And it was only 4:10. One problem at a time conquered with a little planning. That’s how we roll, baby, I said to myself as I hustled us out the door. That’s how we roll.